Here's a great example of a purchasing mistake due to lack of proper research. The seller described this as a 1/2 Quarto from Gibraltar during 1700's. Great! I've never heard of any Gibraltar coins prior to 1802, this is a great find for a Gibraltar collector I told myself. Two months later, after enlisting the help of Bob Reis (anythinganywhere.com), I find out that this coin is a pretty good and historical find of Venezuela - IF it has a visible date and is in decent condition. NOT the case on both counts for this POS! Date is off flan - a BIG ding. 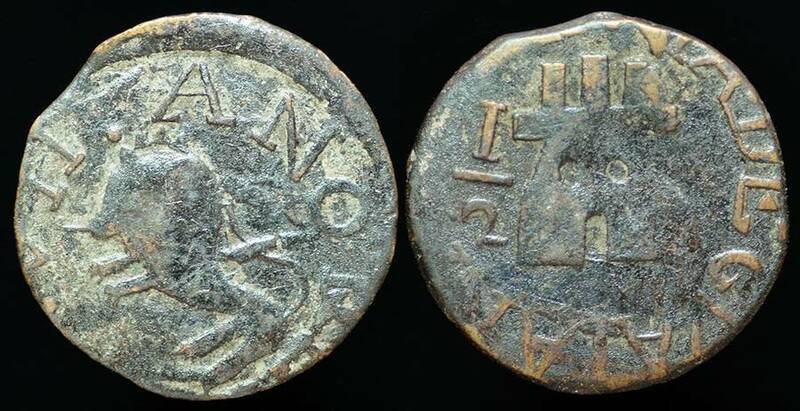 And yes, that's a Lion on the obverse [reversed in photo].